Construction of ABWR at Lungmen Nuclear Power Plant in New Taipei City, Taiwan. 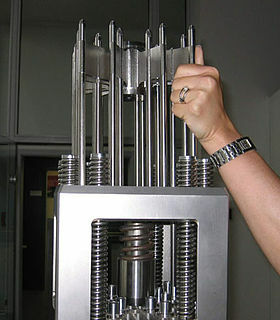 A Generation III reactor is a development of Generation II nuclear reactor designs incorporating evolutionary improvements in design developed during the lifetime of the Generation II reactor designs. These include improved fuel technology, superior thermal efficiency, significantly enhanced safety systems, and standardized designs for reduced maintenance and capital costs. 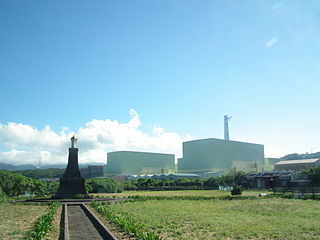 The first Generation III reactor to begin operation was Kashiwazaki 6 in 1996. Boiling water reactors (BWRs) are the second most common  form of light water reactor with a direct cycle design that uses fewer large steam supply components than the pressurized water reactor (PWR), which employs an indirect cycle. The ABWR is the present state of the art in boiling water reactors[ citation needed ], and is the first Generation III reactor design to be fully built[ citation needed ], with several reactors complete and operating. [ citation needed ] The first reactors were built on time and under budget in Japan, with others under construction there and in Taiwan. ABWRs were on order in the United States, including two reactors at the South Texas Project site (although the project is currently halted  ). The projects in both Taiwan and US  are both reported over-budgeted. State-of-the-art refers to the highest level of general development, as of a device, technique, or scientific field achieved at a particular time. It also refers to such a level of development reached at any particular time as a result of the common methodologies employed at the time. The standard ABWR plant design has a net electrical output of about 7009135000000000000♠1.35 GW , generated from about 7009392600000000000♠3926 MW of thermal power. The ABWR represents an evolutionary route for the BWR family, with numerous changes and improvements to previous BWR designs. The addition of reactor internal pumps (RIP) mounted on the bottom of the reactor pressure vessel (RPV) - 10 in total - which achieve improved performance while eliminating large recirculation pumps in containment and associated large-diameter and complex piping interfaces with the RPV (e.g. the recirculation loop found in earlier BWR models). Only the RIP motor is located outside of the RPV in the ABWR. According to the Tier 1 Design Control Document (which is the officially certified Nuclear Regulatory Commission document generally describing the design of the plant), each RIP has a nominal capacity of 7000192000000000000♠6912 m3/h. The control rod adjustment capabilities have been supplemented with the addition of an electro-hydraulic Fine Motion Control Rod Drive (FMCRD), allowing for fine position adjustment using an electrical motor, while not losing the reliability or redundancy of traditional hydraulic systems which are designed to accomplish rapid shutdown in 7000279999999999999♠2.80 s from receipt of an initiating signal, or ARI (alternate rod insertion) in a greater but still insignificant time period. The FMCRD also improves defense-in-depth in the event of primary hydraulic and ARI contingencies. A fully digital Reactor Protection System (RPS) (with redundant digital backups as well as redundant manual backups) ensures a high level of reliability and simplification for safety condition detection and response. This system initiates rapid hydraulic insertion of control rods for shutdown (known as SCRAM by nuclear engineers) when needed. Two-out-of-four per parameter rapid shutdown logic ensures that nuisance rapid shutdowns are not triggered by single instrument failures. RPS can also trigger ARI, FMCRD rod run-in to shut down the nuclear chain reaction. The standby liquid control system (SLCS) actuation is provided as diverse logic in the unlikely event of an Anticipated Transient Without Scram. Fully digital reactor controls (with redundant digital backup and redundant manual backups) allow the control room to easily and rapidly control plant operations and processes. Separate redundant safety and non-safety related digital multiplexing buses allow for reliability and diversity of instrumentation and control. In particular, the reactor is automated for startup (i.e., initiate the nuclear chain reaction and ascent to power) and for standard shutdown using automatic systems only. Of course, human operators remain essential to reactor control and supervision, but much of the busy-work of bringing the reactor to power and descending from power can be automated at operator discretion. Eighteen SORVs (safety overpressure relief valves), eight of which are part of the ADS (automatic depressurization system), ensure that RPV overpressure events are quickly mitigated, and that if necessary, that the reactor can be depressurized rapidly to a level where low pressure core flooder (LPCF, the high-capacity mode of the residual heat removal system, which replaces the LPCI and LPCS in previous BWR models) can be used. Though the Class 1E (safety-related) power bus is still powered by 3 highly-reliable emergency diesel generators that are safety related, an additional Plant Investment Protection power bus using a combustion gas turbine is located on-site to generate electricity to provide defense-in-depth against station blackout contingencies as well as to power important but non-safety critical systems in the event of a loss of offsite power. Though one division of the ECCS does not have high pressure flood (HPCF) capacities, there exists a steam-driven, safety-rated reactor core isolation cooling (RCIC) turbopump that is high-pressure rated and has extensive battery backup for its instrumentation and control systems, ensuring cooling is maintained even in the event of a full station blackout with failure of all 3 emergency diesel generators, the combustion gas turbine, primary battery backup, and the diesel firewater pumps. There exists an extremely thick basaltic reinforced concrete pad under the RPV that will both catch and hold any heated core melt that might fall on that pad in extraordinarily contingent situations. In addition, there are several fusible links within the wall separating the wetwell from the lower drywell that flood the pad using the wetwell's water supply, ensuring cooling of that area even with the failure of standard mitigation systems. The containment has been significantly improved over the conventional Mark I type. Like the conventional Mark I type, it is of the pressure suppression type, designed to handle evolved steam in the event of a transient, incident, or accident by routing the steam using pipes that go into a pool of water enclosed in the wetwell (or torus in the case of the Mark I), the low temperature of which will condense the steam back into liquid water. This will keep containment pressure low. Notably, the typical ABWR containment has numerous hardened layers between the interior of the primary containment and the outer shield wall, and is cubical in shape. One major enhancement is that the reactor has a standard safe shutdown earthquake acceleration of .3G; further, it is designed to withstand a tornado with >320 mph wind speed. Seismic hardening is possible in earthquake-prone areas and has been done at the Lungmen facility in Taiwan which has been hardened up 0.4 g in any direction. The ABWR is designed for a lifetime of at least 60 years. The comparatively simple design of the ABWR also means that no expensive steam generators need to be replaced either, decreasing total cost of operation. According to GEH's Probabilistic Risk Assessment, a core damage event would occur no more often than once in six million years as the core damage frequency (CDF) of the ABWR is 6993160000000000000♠1.6×10−7, second in lowest CDF probability to the ESBWR. Reinforced concrete (RC) (also called reinforced cement concrete or RCC) is a composite material in which concrete's relatively low tensile strength and ductility are counteracted by the inclusion of reinforcement having higher tensile strength or ductility. The reinforcement is usually, though not necessarily, steel reinforcing bars (rebar) and is usually embedded passively in the concrete before the concrete sets. Reinforcing schemes are generally designed to resist tensile stresses in particular regions of the concrete that might cause unacceptable cracking and/or structural failure. Modern reinforced concrete can contain varied reinforcing materials made of steel, polymers or alternate composite material in conjunction with rebar or not. Reinforced concrete may also be permanently stressed, so as to improve the behaviour of the final structure under working loads. In the United States, the most common methods of doing this are known as pre-tensioning and post-tensioning. The RPV and Nuclear Steam Supply System (NSSS) have significant improvements, such as the substitution of RIPs, eliminating conventional external recirculation piping loops and pumps in the containment that in turn drive jet pumps producing forced flow in the RPV. RIPs provide significant improvements related to reliability, performance and maintenance, including a reduction in occupational radiation exposure related to containment activities during maintenance outages. These pumps are powered by wet-rotor motors with the housings connected to the bottom of the RPV and eliminating large diameter external recirculation pipes that are possible leakage paths. The 10 internal recirculation pumps are located at the bottom of the annulus downcomer region (i.e., between the core shroud and the inside surface of the RPV). Consequently, internal recirculation pumps eliminate all of the jet pumps in the RPV, all of the large external recirculation loop pumps and piping, the isolation valves and the large diameter nozzles that penetrated the RPV and needed to suction water from and return it to the RPV. This design therefore reduces the worst leak below the core region to effectively equivalent to a 2-inch-diameter (51 mm) leak. The conventional BWR3-BWR6 product line has an analogous potential leak of 24 or more inches in diameter. A major benefit of this design is that it greatly reduces the flow capacity required of the ECCS. 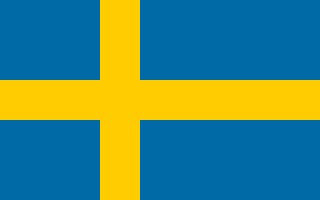 The first reactors to use internal recirculation pumps were designed by ASEA-Atom (now Westinghouse Electric Company by way of mergers and buyouts, which is owned by Toshiba) and built in Sweden. These plants have operated very successfully for many years. The internal pumps reduce the required pumping power for the same flow to about half that required with the jet pump system with external recirculation loops. Thus, in addition to the safety and cost improvements due to eliminating the piping, the overall plant thermal efficiency is increased. Eliminating the external recirculation piping also reduces occupational radiation exposure to personnel during maintenance. An operational feature in the ABWR design is electric fine motion control rod drives, first used in the BWRs of AEG (later Kraftwerk Union AG, now AREVA). Older BWRs use a hydraulic locking piston system to move the control rods in six-inch increments. The electric fine motion control rod design greatly enhances positive actual control rod position and similarly reduces the risk of a control rod drive accident to the point that no velocity limiter is required at the base of the cruciform control rod blades. Model of the Toshiba ABWR. The ABWR is licensed to operate in Japan, the United States and Taiwan, although most of the construction projects have been halted or shelved. Shika Nuclear Power Plant 1 7009135800000000000♠1358 MW Shika, Japan Hokuriku Electric Power Company 2001 2005 The plant is currently not producing electricity in the wake of the 2011 Fukushima Daiichi nuclear disaster. Hamaoka Nuclear Power Plant 1 7009126700000000000♠1267 MW Omaezaki, Japan Chuden 2000 2005 On May 14, 2011 Hamaoka 5 was shut down by the request of the Japanese government. A number of design variants have been considered, with power outputs varying from 600 to 1800 MWe. The most developed design variant is the ABWR-II, started in 1991, an enlarged 1718 MWe ABWR, intended to make nuclear power generation more competitive in the late 2010s. None of these designs have been deployed. ↑ "NRG ends project to build new nuclear reactors". The Dallas Morning New. April 19, 2011. Retrieved 2015-03-14. 1 2 "Bechtel to manage Wylfa Newydd project". World Nuclear News. 22 August 2018. Retrieved 23 August 2018. ↑ "Design Certification Information Page - ABWR". Design Certification Applications. Federal Government of the United States, U.S. Nuclear Regulatory Commission, Rockville, MD, USA. June 3, 2009. Retrieved 2009-08-28. ↑ "Hitachi-GE ABWR design cleared for use in UK". World Nuclear News. 14 December 2017. Retrieved 3 January 2018. ↑ "Toshiba withdraws ABWR certification application". World Nuclear News. 1 July 2016. Retrieved 5 July 2016. ↑ "RWE and E.On halt UK nuclear plans at Wylfa and Oldbury". BBC. 29 March 2012. Retrieved 29 March 2012. ↑ "Oldbury nuclear power station site - Horizon Nuclear Power". www.horizonnuclearpower.com. Retrieved 2018-10-03. ↑ "Horizon suspends UK nuclear new build activities". Hitachi in Europe. 2019-01-17. Retrieved 2019-04-10. ↑ Vaughan, Adam (2019-01-17). "Hitachi scraps £16bn nuclear power station in Wales". The Guardian. ISSN 0261-3077 . Retrieved 2019-01-17. ↑ Thomas, Steve (May 2018). The failings of the Advanced Boiling Water Reactor (ABWR) proposed for Wylfa Nuclear Power Station (PDF) (Report). Greenpeace. Retrieved 20 April 2019. ↑ "Tepco may ask U.S. utility to inspect Kashiwazaki-Kariwa nuclear plant". 30 October 2014. Retrieved 7 February 2017– via Japan Times Online. ↑ "Tepco contemplates 2019 restart for giant Kashiwazaki-Kariwa nuclear plant". The Japan Times. April 22, 2017. Retrieved October 16, 2017. ↑ "J-Power forges ahead with Oma nuclear plant despite local tensions". The Japan Times . 2014-12-16. Archived from the original on 2017-03-04. Retrieved 2017-03-03. ↑ "Nuclear Power in Japan". World Nuclear Association. October 22, 2012. Retrieved October 31, 2012. Wylfa Nuclear Power Station is a former Magnox power station situated west of Cemaes Bay on the island of Anglesey, North Wales. Construction of the two 490 MW nuclear reactors, known as "Reactor 1" and "Reactor 2", began in 1963. They became operational in 1971. Wylfa was located on the coast because seawater was used as a coolant. The "Nuclear Power 2010 Program" was launched in 2002 by President George W. Bush in order to restart orders for nuclear power reactors in the U.S. by providing subsidies for a handful of Generation III+ demonstration plants. The expectation was that these plants would come online by 2010, but it was not met. The Lungmen Nuclear Power Plant, located nearby Fulong Beach, Gongliao District, New Taipei City, is Taiwan's fourth nuclear power plant, consisting of two ABWRs each of 1,300 MWe net. It is owned by Taiwan Power Company (Taipower). It was intended to be the first of these advanced Generation III reactors built outside Japan. In 2014 construction of the plant was deferred. Oldbury nuclear power station is a closed nuclear power station located on the south bank of the River Severn close to the village of Oldbury-on-Severn in South Gloucestershire, England. It was operated by Magnox Limited on behalf of the Nuclear Decommissioning Authority (NDA). Oldbury is one of four stations located close to the mouth of the River Severn and the Bristol Channel, the others being Berkeley, Hinkley Point A, and Hinkley Point B. The Kashiwazaki-Kariwa Nuclear Power Plant is a large, modern nuclear power plant on a 4.2-square-kilometer site including land in the towns of Kashiwazaki and Kariwa in Niigata Prefecture, Japan on the coast of the Sea of Japan, from where it gets cooling water. 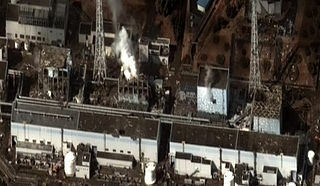 The plant is owned and operated by Tokyo Electric Power Company (TEPCO). Horizon Nuclear Power is a British energy company that is expected to build new nuclear power stations in the United Kingdom. It was established in 2009, with its head office in Gloucester, and is now owned by Hitachi.